He’s been formally charged with spray painting “Black Power” on the Frank Rizzo statue and “the Black community should be their own police” upon the nearby steps in August, but doesn’t think he should be on trial at all. Wali “Diop” Rahman – a 40-year-old Germantown resident who once ran for mayor as an independent – went to the Criminal Justice Center on Wednesday morning expecting his case to be heard. When he approached Municipal Court Judge Jacquelyn Frazier-Lyde’s ninth-floor courtroom, officers with the police department’s Civil Affairs Unit took notice. They were there to keep the peace surrounding what’s become a contentious issue in the city. Once inside, Rahman was flanked by a dozen supporters; he would learn that his trial on charges that included criminal mischief and intentional desecration of a public monument had been delayed until November 29. Michael Coard, one of three attorneys representing the defendant, noted that the commonwealth had only given the defense “discovery” evidence eight days earlier. Considering defense attorneys generally have some 30 days to review such information – in this case, stacks of reports and a video – it wasn’t feasible to proceed this week, Coard said. “We need more time to locate witnesses and do further investigation,” Coard told the judge of why the delay was necessary, an argument with which she ultimately agreed. After a roughly five-minute discussion before the judge, Rahman and Coard spoke not about what would happen at the trial itself, but what they deemed the bigger-picture issues surrounding the case. “It’s more persecution than prosecution that this guy’s on trial,” said Coard, who’s representing Rahman along with co-counsel Joseph Green II and Troy Wilson. He also deemed the late delivery of “hundreds of pages” of evidence as “egregious” and maintained that it jeopardized his client’s right to due process. The Rizzo statue has been the focus of heated controversy in recent months amid calls for removal as Confederate statues are being taken down in other American cities. The city is currently weighing whether it should remain outside the Municipal Services Building, be moved or taken down. Rahman hadn’t spoken publicly about his case, which was caught on video, until Wednesday’s interview with PhillyVoice. 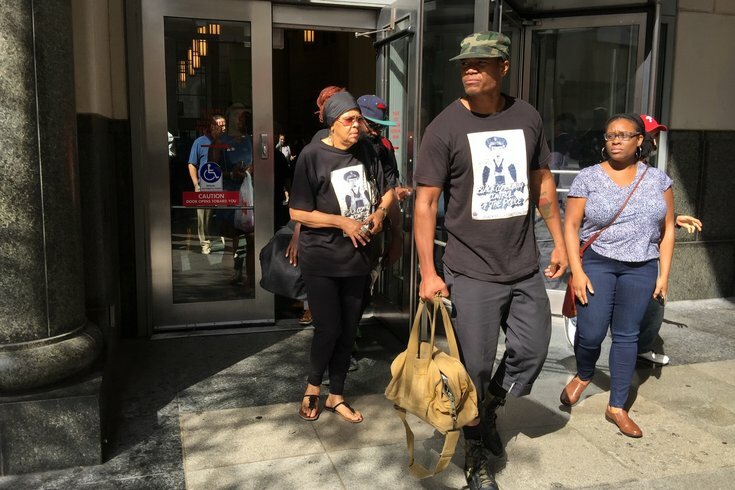 Wearing a shirt that read “Black Community Control of the Police,” black pants and boots to court – along with a camouflage hat that he sported outside of the courtroom – he agreed with Coard's sentiment that he shouldn’t be on trial for the incident. “I’m on trial because I’m a black revolutionary living in a black community,” said Rahman, who was among the protesters taken out of City Council chambers at a September 14 meeting. “Make no mistake about it: The police and the court system is anti-black," he continued. "The racist system should be sorry that statue’s there at all." The assistant district attorney handling the matter, Noel Walton, wasn’t in court on Wednesday to comment on Coard's words. Cameron Kline, spokesman for the District Attorney’s Office, declined to comment, citing its policy not to comment on active cases. Rahman’s trial is now scheduled to begin on November 29, the Wednesday after Thanksgiving.